The earliest clinical applications of tissue engineering revolved around the use of essentially flat materials designed to stimulate wound care. Tissue-engineered skin substitutes dominated the market for almost a decade. Another small and slim tissue that found a clinical application was cartilage. Later in the 1990s thin sheets of cells were produced in culture and then applied to patients using a powerful cell-sheet technology. In both the applications, engineered tissue equivalent is relatively easy to culture ex vivo because oxygen and nutrient delivery to thin, essentially two-dimensional, materials is not challenging. In addition, once the construct has been cultured ex vivo, integration into the body is not an insurmountable barrier for thin materials. Since the inception of tissue engineering there has been a focus on the regeneration of skin. A number of drivers led to this early focus, not least of which was the mistaken assumption that skin is simple to reconstitute in vitro. Skin cells proliferate readily without signs of senescence. Indeed, fibroblasts and keratinocytes have been cultured in vitro for many years with ease. Interestingly, other highly regenerative tissues, such as the liver, are populated with cells that cannot be proliferated in vitro. 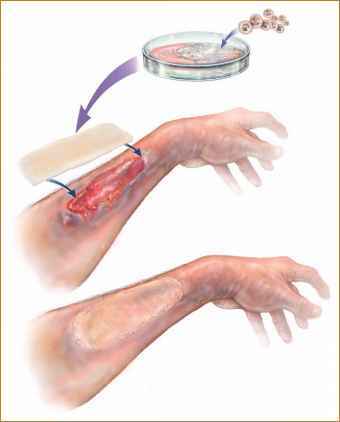 The clinical need for effective skin wound healing was also a major driver. 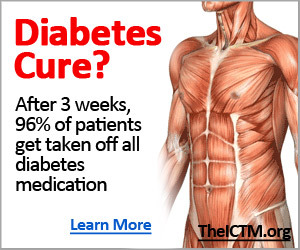 One in seven Medicare dollars is spent on treating diabetes-induced disease in the United States. 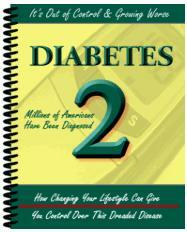 The largest component of that cost goes toward treating diabetic ulcers. This attractiveness drew many tissue-engineering efforts into the wound-care market. INTEGRA® Dermal Regeneration Template is a bilayer membrane system for skin replacement. 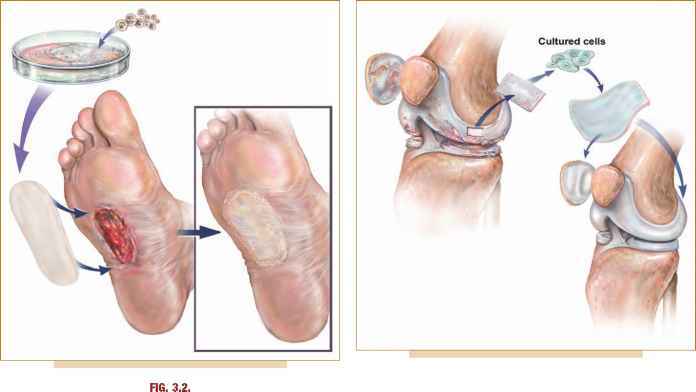 The dermal replacement layer is made of a porous matrix of fibers of cross-linked bovine tendon collagen and a glycosamino-glycan (chondroitin-6-sulfate) that is manufactured with a controlled porosity and defined degradation rate. The temporary epidermal substitute layer is made of synthetic polysiloxane polymer (silicone) and functions to control moisture loss from the wound. The collagen dermal replacement layer serves as a matrix for the infiltration of fibroblasts, macrophages, lymphocytes, and capillaries derived from the wound bed. As healing progresses an endogenous collagen matrix is deposited by fibroblasts, simultaneously the dermal layer of INTEGRA® Dermal Regeneration Template is degraded. Upon adequate vascularization of the dermal layer and availability of donor autograft tissue, the temporary silicone layer is removed and a thin, meshed layer of epidermal autograft is placed over the "neodermis." Cells from the epidermal autograft grow and form a confluent stratum corneum, thereby closing the wound, reconstituting a functional dermis and epidermis. INTEGRA® is now one of many processed natural materials used to stimulate healing. Since the material is not vascularized at point of use, it is best used in thin (two-dimensional) applications. INTEGRA® is an FDA-approved tissue-engineering material widely used in patients today. INTEGRA® does not, however, contain biological factors that are released during the tissue-remodeling process. Another class of products, the thin extracellular matrix-based materials, does release natural factors as the material degrades, and these factors serve to reset the natural tissue-remodeling process, thereby producing a healing outcome. The most common ECM-based material is derived from the submucosal layer of pig small intestine. The Cook OASIS® Wound Matrix label describes the product as follows: The OASIS® Wound Matrix is a biologically derived extracellular matrix-based wound product that is compatible with human tissue. Unlike other collagen-based wound care materials, OASIS is unique because it is a complex scaffold that provides an optimal environment for a favorable host tissue response, a response characterized by restoration of tissue structure and function. OASIS is comprised of porcine-derived acellular small intestine submucosa. The OASIS Wound Matrix is indicated for use in all partial- and full-thickness wounds and skin loss injuries as well as superficial and second-degree burns. Regenerative biomaterials, or materials designed to alter and enhance the natural tissue-remodeling process, are being used in hundreds of thousands of patients worldwide. These materials recruit a patient's own cells into the healing process postimplantation, and their relative simplicity makes them compelling clinical tools for indications where a thin, essentially two-dimensional material will achieve the desired result. In an elegant series of accomplishments, natural matrices have been applied for skin wounds and many other tissue-replacement therapies. isolated from neonatal foreskins prior to seeding onto a polymeric scaffold. Apligraf®, Organogenesis' product, used similar technology to seed and culture cells on collagenbased scaffolds. Tissue-engineered skin equivalents continue to be developed. As technology improves and multilayer systems progress to broad clinical use, the market should also increase from today's anemic levels of $15 million/year. The FDA and reimbursement issues have greatly impacted clinical use of cultured skin equivalents. The FDA treated these products as devices yet held them to biologic standards, and this led inevitably to their being reimbursed as biologics. Another approach to clinical skin remodeling is using autologous cell-based therapies (Fig. 3.2). One attractive feature of using a patient's own cells is, of course, the lack of an immune response, but the manufacture of patient-specific yet inexpensive skin replacements is very complex. Epicel® from Genzyme Biosurgery uses irradiated mouse fibroblasts as a feeder layer from which to grow patient-specific keratinocytes. Co-culture with animal-derived cells may raise regulatory and infectious disease questions requiring manufacturing practices that increase the cost of goods. In 1995, Genzyme began expanding patient-specific chondrocytes. Small biopsies were sent to Genzyme, where they were cultured and returned to the surgeon for implantation. The product, Carticel®, was approved as a biologic by fig. 3.3.
the FDA in 1997. At time of treatment, a patient typically receives 10 million to 15 million cells after five weeks of custom ex vivo culturing. As with skin remodeling, a number of companies have focused on the use of acellular regenerative materials. Approved products are currently sold in many countries around the world that are based on collagen and/or extracellular matrixes (ECMs). Thousands of patients around the world have benefited from orthobiologic approaches to cartilage replacement. Although patient-specific cartilage replacement therapy has also provided benefit, it is a good example of the difficulty of delivering individualized therapies while deriving a profit. The considerable infrastructure required to culture tissue safely in this manner presents unique challenges for the manufacturer to overcome. Many research groups around the world have sought to improve on the efficacy of Carticel®, focusing on cell-based and regenerative material-based approaches. Although cartilage segments in vivo and in vitro are generally small and non-vascularized, the biomechanical properties of those tissue-engineered cartilage products overall have not achieved the standards required for clinical application. cell-cell contacts. Cells processed in this manner are delivered as single cells for clinical application. Okano envisioned an alternative for removing cells that has had a dramatic clinical impact. Okano covalently bonds a layer of N-isopro-pylamide to the surface of the culture dish prior to adding cells and has shown that, under normal growth temperatures, cells adhere but that when slightly chilled, the entire sheet of cells is repelled from the dish without disrupting the cell-cell contacts and can be lifted from the surface rather like a Post-it note®. For a first clinical application, Okano's team cultured corneal epithelial cells and used the resulting sheets to replace the damaged corneal epithelia of dozens of patients. 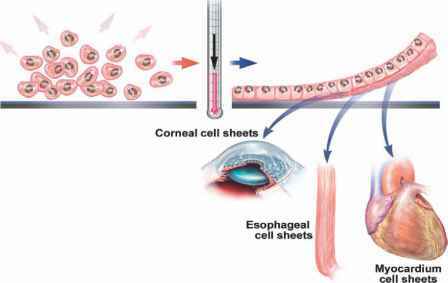 Okano has reported significant success and, although the number of patients in need of corneal epithelial replacement is limited, this cell-sheet technology has real potential for broader clinical tissue-engineering application. 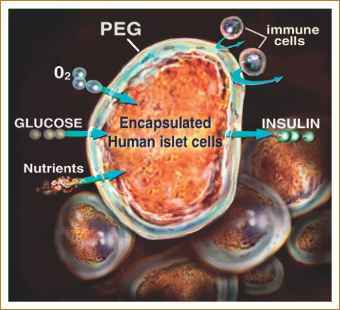 and this has now been shown to eliminate insulin dependence in diabetic animals.